Over a month almost two years ago, an artist painted the walls of the Duke Health Center in Durham, N.C.
Each section of the building’s interior now represents a different part of the globe. The front waiting area is a jungle with smiling monkeys swinging from vines; one back hall takes a visitor through Europe; turn another corner, and they are amid the snow and ice of the Antarctic. Each area is truly its own world. 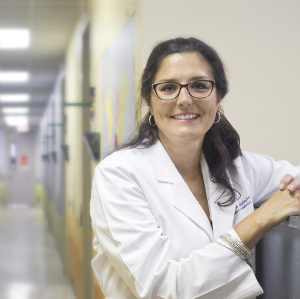 Within this world, and among patients and medical trainees, Dr. Suzanne Woods is at home. Since 2002, Woods has been the Program Director for the combined training program in Internal Medicine/Pediatrics at the Duke University School of Medicine. A typical day for her can include scheduling rotations; working clinically with trainees in an inpatient, continuity clinic or subspecialty outpatient setting; advising; mentoring; making sure residents are keeping up with their daily activities. It involves monitoring hours, completing evaluations and working on assessments. In short, being a Program Director is a diverse and time-consuming job, requiring significant skill and dedication. She also strongly feels strongly that certification, and maintaining that certification, matters greatly to both residents and diplomates (certified pediatricians), as well as to patients and their parents/caregivers. “Having the certification from the American Board of Pediatrics means that an individual physician is committed to delivering excellent, high-quality and evidence-based care. It says something to the community, and to the public at large. Being a physician requires a huge commitment to developing competence and expertise in core areas, she said. As Woods walks through the halls of the health center, explaining her job and the facility itself, she passes yet another region of the world painted on the wall. Her thoughts jump to the artist who did the work; the woman who transformed this doctor’s office into one big, inviting fresco over the course of just a few weeks. Considering the time constraints and space covered, completing the task was nothing short of monumental. “I don’t know how she was able to do such a good job in such a short amount of time,” she said. It must have taken the same kind of dedication, caring and commitment that Dr. Woods and other program directors throughout the nation have to their residents and patients.